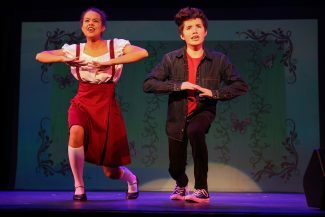 ﻿(Tanzi Propst/Park Record) YouTheatre’s production of “Emma! A Pop Musical” is based on Jane Austen’s 1815 novel “Emma” and features songs made popular by the Supremes, Whitney Houston, Katy Perry and Cyndi Lauper. ﻿(Tanzi Propst/Park Record) YouTheatre rehearses Eric Price’s “Emma! A Pop Musical” that will open for a three-show run at the Egyptian Theatre on Friday. 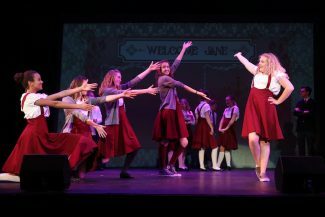 Egyptian Theatre's YouTheatre director Jamie Wilcox knew she wanted to present a different kind of production for this year's spring musical. She knew she found it when she came across Eric Price's "Emma! A Pop Musical." "It's always hard to find new material and you kind of want to do something different, because there are a lot of musicals that get done over and over again," Wilcox told The Park Record. "I love Jane Austen's books, so when I found this, I immediately fell in love with it." YouTheatre will present "Emma! A Pop Musical" on Friday and Saturday, May 12-13, at the Egyptian Theatre. While the production is based on Jane Austen's 1815 novel "Emma," most of the songs have been made famous by modern-day female singer-songwriters and legendary girl groups. "We have songs by the Supremes, Whitney Houston, Katy Perry and Cyndi Lauper, to name a few," Wilcox said. "Music director Stania Shaw is an opera singer by training, and has had so much fun teaching the kids these pop songs." While "Emma! A Pop Musical" does feature male roles; it is a very girl-power production. "I'm so happy that we're presenting this on Mother's Day weekend, because the moms and grandmas who come will recognize the songs," Wilcox said. Some of the songs featured in the production maybe decades old, but the musical is set in a modern-day school, called Highbury Prep. "Emma fancies herself a matchmaker," Wilcox said. "She's a senior now, and her goal is to find a boyfriend for her friend Harriet, who is a sophomore." The class structure of the school is like it was back in Jane Austen's time, with little twists. "The first person Harriet shows interest in works in the school cafeteria, and Emma is horrified," Wilcox said with a laugh. "This is the same sort of things we read about in the original book." Austen's books often staged a microcosm of England's issues in the early 1800s, such as the upper class' treatment of the middle class. "Jane Austen played a lot with the class structure in all of her books, including my other two favorites 'Pride and Prejudice' and 'Sense and Sensibility.' The sad thing is not a lot has changed as much as we would like it to." Wilcox believes the lack of change over the centuries is the reason why Austen's works are read today. "I think the reason 'Emma' remains a popular story today as it was when it first published is because it is still being read the same reason Shakespeare is being read," Wilcox said. "They both talk about universal things." This is what makes a story like "Emma" easy to adapt to the modern day. "You can set this in any time period," Wilcox said. "In fact, the movie 'Clueless' (1995) was based on 'Emma.'" Wilcox loves using plays and musicals like "Emma" to introduce kids to authors who many would not read unless they were told they had to for school. "It's like giving them a different path to these books and it's a lot of fun," Wilcox said. She also likes that the upcoming production is a mash-up of 1815 and 2017. "Our choreographer, Chantelle Wells, has worked into the dancing, some elements of what you would have seen in dances during Jane Austen's time," Wilcox said. The nods to the past are also evident in the set design and costumes. "While the sets are very sparse and we use a lot of video projections, our video designer, Jenn Silva, has flavored her illustrations with storybook illustrations that reflect that time," Wilcox said. "And the costumes, which were made by Angie Tallent with the help of Candy Summerhays, have the square necklines and puffy sleeves, although they are wearing school uniforms." "Emma! 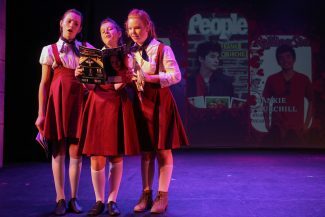 A Pop Musical" features 24 kids, including Kasey Kirklen as Emma, Katie Lobrot as Harriett, Jack Sheehan as Jeff Knightley, Josephine Nuebecker as Jane Fairfax, Marcello Caro as Frankie Churchill and Calder McEneanny as Philip Elton. "I've known most of these kids since I started working with YouTheatre five-and-a-half years ago," Wilcox said. "It's so much fun to watch them grow into these roles. It's fun to watch those transformations. I also love getting to know the kids. They are so talented and it's fun to be part of it. 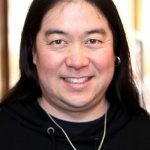 "One of the things I most enjoy in general is that I do so much administration that this is a way for me to get back into the classroom and work closely with a big group of kids. It energizes me. " Egyptian Theatre's YouTheatre will present "Emma! A Pop Musical" at 7 p.m. on Friday and Saturday, May 12 and 13, and at 2 p.m. on Saturday, May 13, at the Egyptian Theatre, 328 Main St. Tickets are $14 for adults and $9 for youths ages 17 and younger. For information and tickets, visit http://www.parkcityshows.com.